Active surveillance is one of the 6 viable treatment options for men with prostate cancer who do not undergo immediate radical treatment such as surgery or radiation therapy. Cancer of the prostate often grows slowly; therefore active surveillance is used as a strategy to manage early stage, low risk prostate cancer, without taking immediate action. However, there is no guarantee that the cancer won’t progress while under surveillance. It’s important to stress that undergoing active surveillance does not mean that you are not having treatment, but rather you are monitored and treated when your cancer warrants action. MRIs aren’t necessarily required, but are becoming more popular for surveillance onset. MRI prior to going on surveillance should be normal or show a small tumor, less than 1cm in order to be considered for active surveillance treatment. Surveillance patients are monitored quarterly for the first year then twice a year thereafter. There is a mandatory biopsy one year after diagnosis then the biopsy schedule varies with patient age, number of positive cores, etc. Additionally, the doctor’s conduct bi-annual prostate-specific antigen (PSA) blood tests and digital rectal exams (DRE) scans. If these become suspicious, a biopsy will be conducted. With these consistent scans and benchmarks, the doctors will be acutely aware of any new activity, in order to reduce the patient’s risk as early as possible. 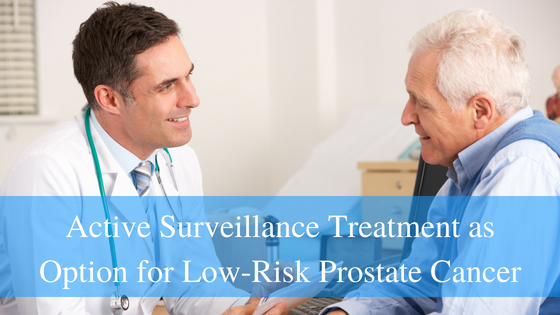 Active surveillance is often the first choice of treatment for patients with prostate cancer because prostate cancer poses a relatively low risk of harming or decreasing the life expectancy of a patient. It often grows extremely slowly, and in some cases, will not affect a patient in their lifetime, making the radical treatment side-effects unnecessary. A Johns Hopkins study done in the mid-1990’s found that only 1.5% of the men studied had meaningful progression of their prostate cancer disease 20 years later. This reflects the reality of the remarkably low rates of their disease spreading or dying of prostate cancer. For the men studied there wouldn’t have been a difference in outcomes if they had immediate treatment or underwent active surveillance. The key to these successful numbers though is making sure you are monitored regularly, and that you undergo treatment if the cancer becomes more aggressive or larger. About 20% of patients will fit the rather strict criteria for surveillance. Below are some of the characteristics of candidates that typically fit the active surveillance guidelines. Patients with low-grade prostate cancer, meaning the cancer is confined to the prostate. Older patients with a limited life expectancy. Younger men will live longer with their cancers, and thus have a higher likelihood that their cancer could progress. In addition to monitoring, during active surveillance patients are proactive by changing their diets, exercising and managing stress to enhance their body’s genetic ability to inhibit tumor activity. Treatment is most successful in the earlier stages of the disease. If you are experiencing any symptoms of prostate cancer, it is best to consult your physician as soon as possible.